I’m writing about me! Today is Winter and furnace problems, Anna Pigeon. 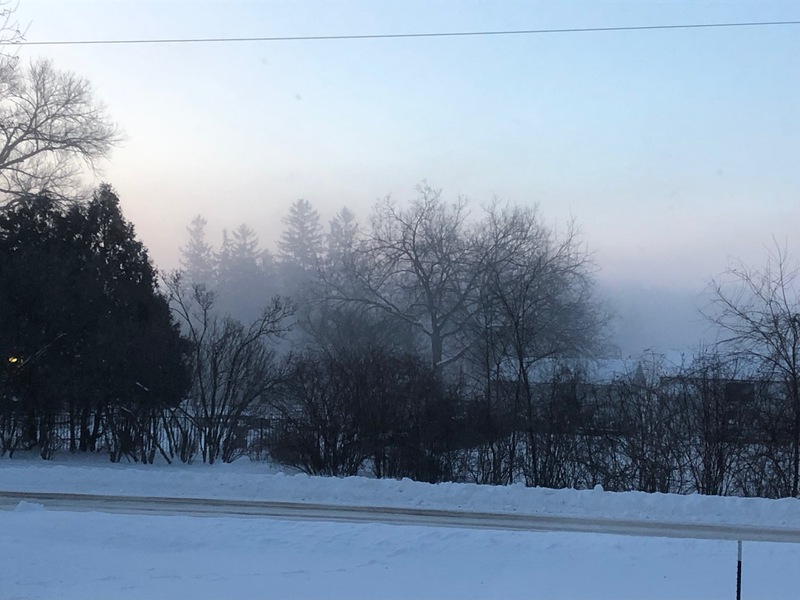 It’s January 31, 2019, and when I woke up the outside temperature was -31 degrees. As was the wind chill because there was no wind. It’s up to -12 now. At 7am, the river was releasing a really cool fog-like condensation. I took the image below to share here. But first, this furnace-thing. We have two, one for the new part of the house, and one for the old part. Last week, Van had the repair guy out because the new-part furnace was cycling on and off rapidly. They put a new piece in but it’s still doing it. For now, we just turned up the infloor heat. Now this week, the old-part furnace is not blowing any heat. It will be tomorrow before anyone gets out to look at it. And this is also the call where we learned that we were only covered for one furnace in our maintenance plan. Who knew? They’ve been coming here since we moved in. But now we will have to pay to have this one managed. I finished the book “Boar Island” by Nevada Barr this morning. The focus was on child cyber-bullying with a shared plot of someone with diminished mental capability going on a murder spree. I always enjoy Anna Pigeon – she’s tough, she’s aging, and she’s interesting. Next up is “Crushing It” by Gary V.
I’m out of here – heading to Crossings for the rest of the afternoon.